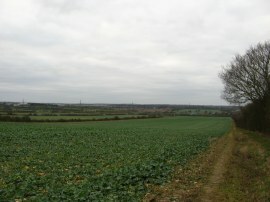 I did this walk on Sunday 8th January 2012. 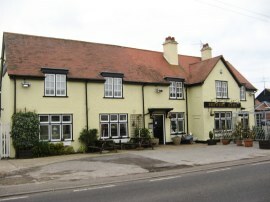 I parked in the small car park besides the Brewers Arms Pub, photo 1, in the village of Bicknacre, close to the path from Thrift wood where I had finished the last stage of my walk along the St Peters Way. It was quite a grey gloomy day although once again very mild for the time of year. Just like when I walked the last stage there was a fairly stiff breeze which was blowing into my face on the outward leg, although this did die down around lunchtime before picking up again as the day progressed. One of the things I like about being out walking is being able to notice these subtle changes of weather which generally go by unseen, particularly if you spend all day in an office. From my parking spot I headed a few yards down to the main road, passing the little St Andrews Church, before turning left into The Grove and then almost immediately left again into Lyndhurst Drive. Reaching the end of this road the route heads to the right along Brockenhurst Way and then to the left along Deerhurst Chase. Reaching the end of this, the path leaves the tightly packed modern houses it had been passing through and heads along a short stretch of footpath on the left that heads out to join a broad path heading across Bicknacre Common, photo 2. Just before this stretch of path reaches a road the route heads to the right, crossing a small wooden footbridge and stile to pass through the grounds of some well kept stables, the well marked path winding its way between the paddocks before heading out across an open field. The path heads diagonally to the left across the field before joining a field edge path that runs past two long low barns which I guess might house chickens. There were a number of large extractor fans attached to the buildings, photo 3, which were giving off a rather unpleasant smell when I went by. Reaching the end of the barns the route joins a broad farm track that heads between a couple of fields before bending round to reach a small industrial estate in the village of East Hanningfield. Continuing ahead through the estate, photo 4, the path soon reaches The Tye road and where the path joins the road there was a notice board detailing all the footpaths in the parish which was nice to see. 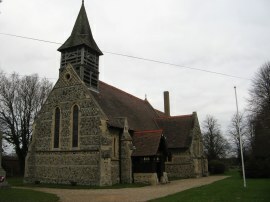 The St Peters Way heads the right alongside the road, passing All Saints church, photo 5, before heading to the left up a drive that leads to the village playing fields and shop. 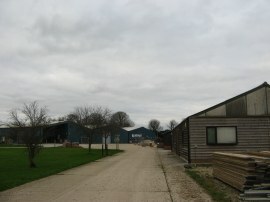 The route then heads to the left in front of the shop before bearing right across an area of open space to join a footpath running alongside the edge of fields, photo 6. As I was walking along this stretch of path I spotted a little metal disc lying on the ground in the mud which on closer inspection turned out to be an American quarter. This was an unusual find on an Essex footpath and got me wondering how the coin had ended up in the mud and what its history was. 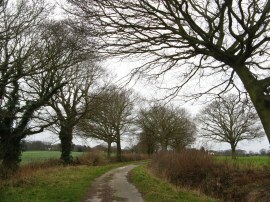 This stretch of path leads down to a minor road, Back Lane, which the route heads across to join another similar path running alongside the edge of fields. Heading through a gap in the hedge the route continues ahead with far reaching views opening up away to the left over the Essex countryside. Reaching Hill Farm the route starts heading gently downhill besides a long rectangular field, photo 7, down towards the rather busy and noisy A130. In the distance ahead of me I could just make out the waters of Hanningfield Reservoir behind the supporting dam. Reaching the end of the field I got a bit of a surprise as there was a new dual carriageway, well newer than my map anyway, which had been constructed alongside the route of the old A130 however it was nice to see there was a very solid footbridge, photo 8, crossing the new road with its own St Peters Way footbridge road sign. Once over the bridge the route heads over a farm access track and out across the middle of fields, heading under some tall electricity pylons, photo 9; the route continuing to take a fairly straight course across the Essex countryside. 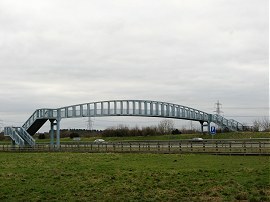 The route crosses a narrow footbridge over a drainage ditch and heads out across the middle of the next field before heading to the left at the end of the field and then to the right along the edge of the following field. This stretch of the walk was accompanied by the quite loud noise of shooting going on in a nearby woodland, the shots echoing out on a very steady, and rather annoying, basis. The path continues on along the field edge for some distance, passing under more electricity pylons before eventually joining a broad tree lined path, photo 10. 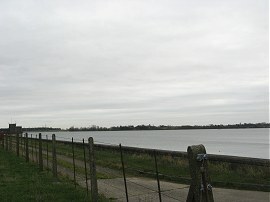 As I headed down this path the waters of Hanningfield Reservoir once again briefly came into view on the left. Eventually the path reaches a house and crosses over the end of a road before continuing ahead along the edge of another smaller field. 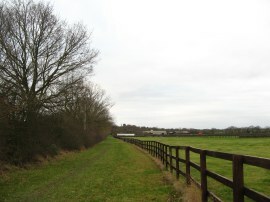 The route then joins a more enclosed stretch of footpath heading besides a school playing field before bending round to the left to head down to Church Road in the village of West Hanningfield. 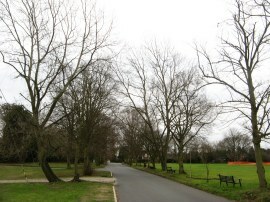 Here the route heads to the right through the village along Church Road. The route then bears to the left by the Three Compasses Pub and then left again up Pynnings Farm Lane for a few yards before joining another field edge footpath on the right, just past the last house. 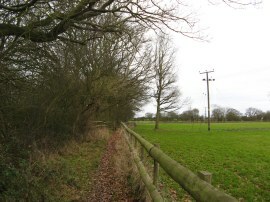 A field edge footpath is then followed along the top of two fields before turning to the left down the edge of a third field. 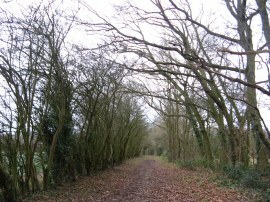 This path leads down to a tree lined byway, Seamans Lane, photo 11, where the route heads off to the right. This lane was surfaced and I am guessing must once have been a road before its course was obstructed by the construction of the Hanningfield Reservoir. 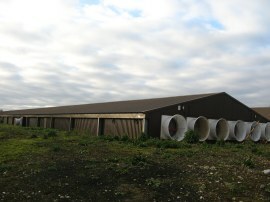 This was completed in 1957 and is filled by water pumped over from the Rivers Chelmer and Blackwater. Reaching a road, Leather Bottle Hill, the route heads off to the right before joining a footpath on the left besides Lavender Cottage. This footpath heads alongside gardens and then across the middle of a playing field to join another road. Here the route bears to the left along the Mill Lane through the village of Stock where a woman was out mowing her front garden despite it being only the second week of January. Nestled in amongst the houses on Mill Lane was Stock Tower Mill. 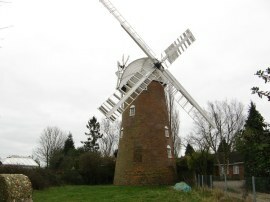 This windmill, photo 12, was built around 1816 and is a five storey tower mill with four single Patent sails and has been owned by Essex County Council since 1947. On the map the St Peters Way is shown as heading to the right along Mill Road from the end of Mill Lane however just before I reached the end of Mill Lane there was a St Peters Way sign sending the route along a footpath on the right which runs on a parallel course to the road between houses down to Common Road, photo 13. Here I headed to the right and reaching the junction of Common Road and Stock Road I finished this stage of my walk along the St Peters Way having walked a further 7.75 miles along the path. This point is handily situated by the Stock Village Hall where there is a car park for the start of the next stage. As usual I have uploaded the route of the walk which can be accessed here: St Peters Way Stage 4 Route. When I was planning this walk I had spent a long while trying to find a decent circular route to use on the way back to Bicknacre however there was really nothing obvious or convenient so I more or less followed my footsteps back the way I had come. 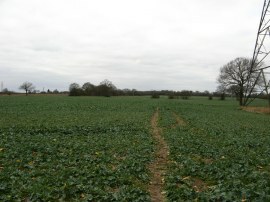 I did however take Lower Stock Road back between Stock and West Hanningfield which although quite a long stretch of road walking was very quiet and I was only passed by six cars while on the road. I then detoured down to have a quick look at the Hanningfield Reservoir, photo 14, although I was completely the wrong side for the visitors centre so had to content myself with a quick look across the waters from the edge of the dam, having had to climb through a gate to get any view at all. 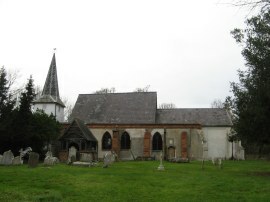 From there I headed up through West Hanningfield via St Mary & St Edward Church, photo 15, back to the St Peters Way for the remainder of my journey home, walking a total of 15 miles for the day.